As a potential new homeowner, it can be overwhelming trying to figure out if you should stop renting and buy a new home. 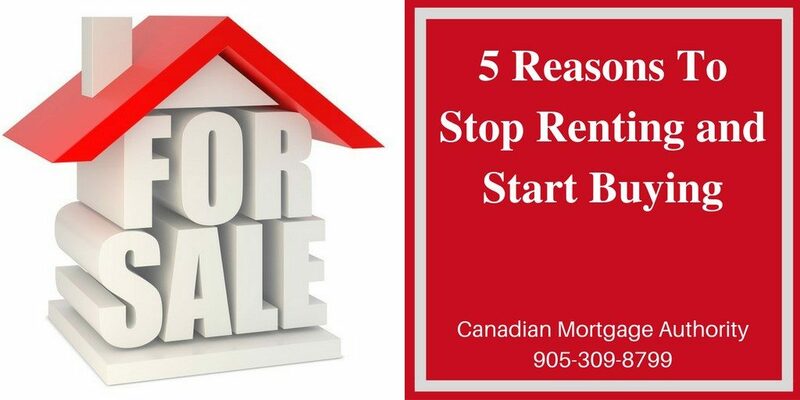 Well as your local Hamilton and Grimsby mortgage broker, our team at Canadian Mortgage Authority has created a list of the top five reasons why you should buy a home instead of continuing to rent. Owning a home means you have the artistic freedom to decorate your house any way you would like to. If you want to paint the walls a crazy color or expand your kitchen, then you have the right to do that without having to pay a fee to a landlord or ask for their permission. You also will have more privacy because you will not have to answer to a landlord. You make your own rules and you can schedule all your maintenance visits whenever you want—instead of being told last minute when someone is going to show up. Those who own a home have a sense of pride and are more likely to be involved in the community than those who rent. Community involvement is an excellent way to meet new people and apply your skills. It is also a great opportunity to improve the area in which you live in. Home equity is the difference in your home’s value and your mortgage balance. The more you pay towards your Hamilton or Grimsby mortgage, the more equity you have in your home. You can then use your equity to pay for anything you’d like, such as more real estate, home renovations, pay off debt, pay for education, or even to go on a dream vacation. If you rent, your landlord has the right to increase their monthly rates, annually. This means that you can be spending more money every year on housing than originally anticipated. Owning a home in Canada is a more stable option because you can receive a five year fixed term. This will allow you to budget more accurately since you will know exactly how much you owe during that period of time. Buying a home is a huge financial commitment, but it comes with a lot of added benefits. To get started on your Grimsby or Hamilton mortgage application, please contact the Canadian Mortgage Authority at 905-309-8799.